Theater Solutions by Goldwood in-ceiling 70 volt speakers are an installers dream come true! High quality, lush bass and a full bodied sound at an affordable price. Each speaker comes with a 70 volt transformer, making them perfect for commercial applications. The transformer has 5 different tap settings, 16 watt, 8 watt, 4 watt, 2 watt and 1 watt. The speaker also allows the transformer to be bypassed for standard installations. The speakers are made with only the highest quality, moisture resistant materials to deliver unsurpassed sound in any listening environment. Sophisticated design and measurement equipment, including computer assisted design software were used to design these speakers to achieve an optimized balance and interface between components to give better quality performance and longer life. Each speaker has paintable white aluminum grills that offer added rust protection in moisture-prone areas such as bathrooms, kitchens and saunas; as well as a fabric scrim inside the grill that hides the drivers from view and will not interfere with the sound. 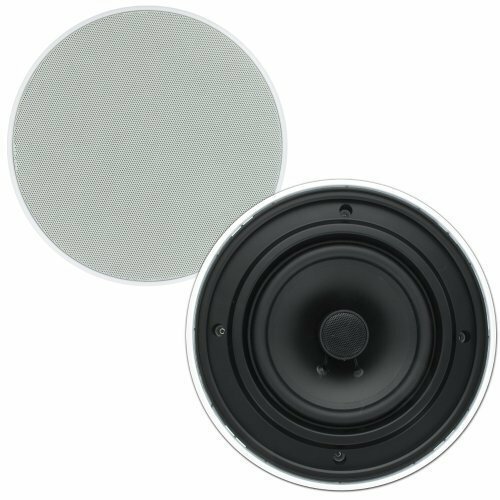 The woofer is a poly mica 6.5" driver with butyl rubber surrounds. The 1/2 inch pivoting silk dome tweeter pivots while inside the woofer to direct sound at listeners, and its back chamber smooth's and extends its performance. These state of the art components all add up to superior quality and design at a value that is second to none! View More In Ceiling & In-Wall Speakers. If you have any questions about this product by Theater Solutions, contact us by completing and submitting the form below. If you are looking for a specif part number, please include it with your message.